OFFICIAL BLURB: Jezzet Vel'urn is a trained swordswoman. She has rightfully earned the title Blademaster, and she knows that for a woman like her there are generally just two ways out of most hostile situations; fight or fornicate. All too often for Jezzet's liking, it comes down to some gods-be-damned combination of the two. In The Heresy Within Jezzet is chased into the Wild by a vengeful warlord until she finally makes it to the sovereign city-state of Chade. But instead of sanctuary, she finds only more opportunistic bastards waiting to turn her over to her enemies. Also figuring majorly in the story is Thanquil Darkheart, a sorcerer hunter called an Arbiter, tasked with hunting down and purging heretics for the Inquisition. Thanquil is given a task by the God Emperor of Sarth from which he has no escape. Lastly there’s the brutal outlaw called Black Thorn, best known perhaps for the killing of several Arbiters and possibly being one of the biggest names in the Wild for his proclivities. All three of their fates seem to be converging on the Free City of Chade and, before long, Jezzet, Thanquil, and the Black Thorn will have to confront each other as they find themselves facing The Heresy Within. 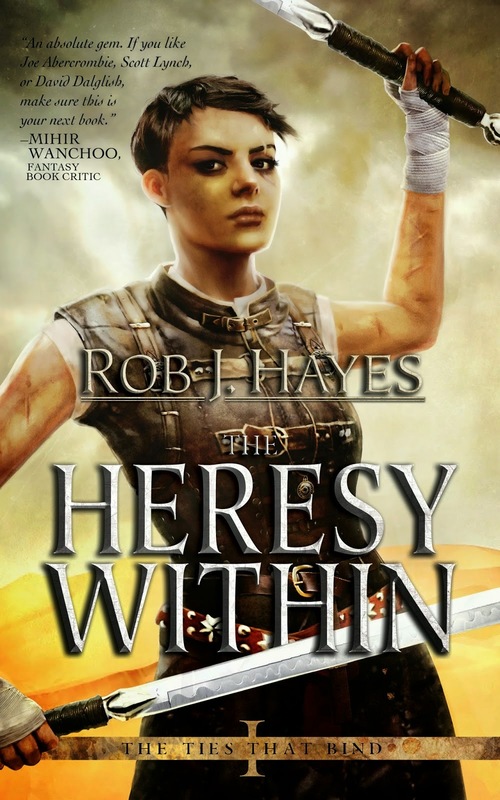 November 10, 2014 marks the American e-book publication of The Heresy Within via Ragnarok Publications. Cover illustration is provided by Alex Raspad. ANALYSIS: This book was originally self-published by the author last year and it completely blew my mind. When I first read it, I had no clue about this book but the blurb suggested a dark story and the excerpt that I read had me salivating as soon as I finished it. The story safe to say was far from a disappointment. The story begins with Arbiter Thanquil Darkheart who is a member of the Inquisition that seeks to root out demons and those who practice the dark arts in the lands in and around the holy city of Sarth. They are an organization who based on the teachings of Volmar, and have dedicated their lives trying to burn heretics and forever stamp out the dark arts. Such dedication has given them the street title of “witch hunters” and it’s one that is actively discouraged as well. Thanquil is however not a typical arbiter and is just returning from a distant mission before he gets shanghaied into an even more dangerous one. That’s the basic gist of all the POV characters however there are more and all of them crazier and scarier than these POV ones. If I had to pinpoint the one single strength of this book, I would say it’s the characterization. Very few authors manage to write such terrific characters in their debut, only a few such as Scott Lynch, Joe Abercrombie and Anthony Ryan come to mind but now I believe we have another addition to this list. Rob J. Hayes who writes about lowlifes and scum but writes with such wonderful application that these very characters seem fascinating gems and before long have you hooked onto their antics. This is the best part of the story, and very reminiscent of Blake Crouch and J. A. Konrath’s serial killer thrillers wherein they explored the darker side of human depravity and power. There are plot twists galore as the story hardly moves in the direction that the readers would expect and in the end the author makes sure that the rules of the world are obeyed in the sense that no character is truly safe. The author also subverts several fantasy tropes by not following conventional storylines Case in point the God Emperor of Sarth was a farm boy who was revealed to be a human incarnation of Volmar. However the author doesn't focus on this and mentions it and moves on to the juicy parts. There are quite a few deaths and so I would recommend that readers not read the blurb of the next books to not spoil their reads. The ending is very Abercrombie-like wherein situations are resolved but the characters are put through a psychological and physical grinder of sorts. All in all this is a kind of debut that you definitely don’t want to miss because as soon as you finish this book, you’ll want to start the next one and then the one after that. The great news is that the next couple will be released soon and therefore ready to be devoured. CONCLUSION: Who is Rob J. Hayes, I don’t know entirely but I’m willing to bet that before the year ends, many readers will have heard his name and also become fans of his. The Heresy Within is a debut and like 2012’s Blood Song is an absolute gem. If you like Joe Abercrombie, Scott Lynch or Mark Lawrence, make sure this is your next book. If you want a dark journey filled with action, betrayals and truly magnificent bastards of characters then The Heresy Within is the book that you should seek. DO NOT MISS IT! Good to hear! I just got offered a review copy of this earlier in the week, and despite my towering pile of reads, I couldn't say no to this. Glad you enjoyed it so much, and that I made a good choice in finding room for it. RJB's debut has been a fantastic read for me. The best part the sequel is even better (it was my fav. book last year) & the trilogy is complete so no waiting for longer than 2-3 months between the titles.